Just purchase a new 2009 Concour. I notice a lot of heat on my legs and feet. Do the Kawasaki wind deflectors work? Is there another product on the market to deflect the heat away from the rider? Have a 2004 that I installed crash bars on that I installed highway pegs to. Putting my feet up on them lets cooling air run up my legs and helps greatly. May work with your '09. Good luck. I too have a 09 and living in Ft Lauderdale area I'm cooking on the days that have a heat index over 100. I wrapped the exhaust from in back of the clamp past the header w/little improvement. 010 has a heat shield on the exhaust pipe. Bought the neoprem inserts off this sight, helped some. 010 extended the fairing around deeper toward the motor. I bought 2 plastic hood scoops small in size from Ebay and taped them over the clutch housing (BWM K1300 GT has a shield)and on the other side to balance the look and this helped lots. Bike was running in the same temp. range on the gauge. I made a set of lower wings to draft in air while running down the road and this did the trick! They came off when I was trying to drag by peg on a on ramp to 95. Double the speed on the turns and add 10 more miles to the speed and see how it handles? I like it!! Still interested in the BAKER WINGS but got no feed back from the forum. Tom, do you experience the engine running hotter with the flaps installed? I have seen no change in system temps or cool down time with and without the fans. I've sat in stopped rush hour traffic in mid-90 temps with no ill effects and it's much more comfortable. The flaps haven't melted either. I also bought a silver car windshield sun shade and cut it to fit under the gast tank leaving a couple extra inches to tuck under the side covers. This keeps the tank cooler and stops hot air from blowing out the seams. Re: heat deflectors good or bad? Have all the Baker Wings on my '08 C14. I would say priority is: Bottom - to cool feet/lower legs, Top - to block or direct wind to hands/arms and lastly the Middle - (single small top/long bottom assembly) to further block or direct air to upper legs/mid-body. 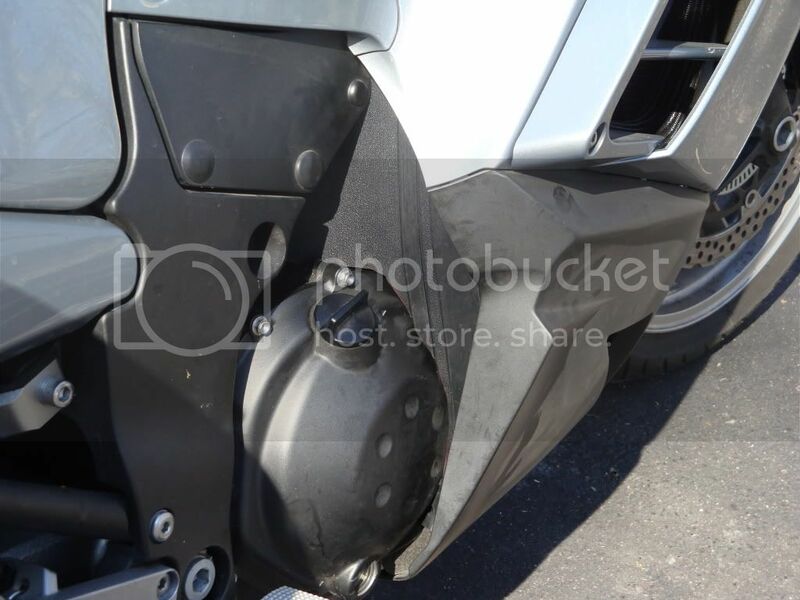 But be aware that the Middle set connect to the exhaust port flange on the fairing, not a solid fairing piece, so the flange mounting points may start cracking (can just reinforce around the flange mounting holes or make some type of strain relief). They have worked well for the last 25K miles and the flange mounting holes are just starting to crack a little (I'll have to reinforce them somehow because I don't want to really give them up even though they are the lowest priority). I purchased some neprene cutouts from an individual that are meant to be placed in the spots just in front of your feet in the lower cowling and they work well. Now the shields have formed to the contours of the plastic and remain that way when I remove them for servicing etc. Just another option.